Small business owners have an uphill battle when it comes to giving gifts during the holiday season, as everyone has different items on their wish lists. Sometimes the best strategy is to give presents that every recipient can use, like tech products. According to the Ketchum Digital Life Index, consumers want gadgets that simplify their lives. You can give your clients and employees small devices that make many basic tasks easier. Below are some trendy tech gifts for everyone on your holiday shopping list. USB drives are popular accessories because users can bring their files anywhere without carrying computers or relying on wireless connections to access cloud services. Models with unique features can make great personalized business gifts, as they have functionality beyond data storage. A great gift for employees may be a USB drive that’s attached to a promotional pen. The gadget connects to the pen cap so workers won’t lose either item. Additionally, there’s a model that also has a Wi-Fi detector to help your staffers find internet connections when they work remotely. Your clients may want flash drives that are both stylish and functional. There are keychains and bracelets you can give your loyal customers that hide their USB drives. December is also AIDS Awareness Month, and there are storage devices modeled after the awareness campaign’s red ribbon. Technology cannot make consumers’ lives simpler if the gadgets are difficult to use. For instance, a common complaint about some laptops is that the touchpads make on-screen navigation impossible. A wireless mouse can combat this problem. Employees will appreciate functional presents that make computing easier. Clients may also enjoy receiving the peripheral devices as holiday surprises. You can also keep an eye toward the future with your presents. Laptops are quickly being replaced by tablets and smartphones, so you may want to give unique promotional products as gifts that make those mobile gadgets more functional. A branded stylus pen can make touchscreen phones easily navigable and a USB hub can increase a tablet’s functionality. Mobile devices often have short battery lives. Users are frustrated when there aren’t any available chargers. Small business owners may not be able to give all of their customers and employees long-lasting batteries for the holidays, but mobile charging stations can make great promotional gifts. Recipients may be surprised when you give them solar chargers during your celebrations. The power sources can charge smartphones and tablets for a few hours. These can be great gifts for employees who need their phones for business calls throughout the day. Solar chargers can also be effective promotional giveaways. Tech-savvy clients will be exposed to branded content each time they use their power sources. You should base your gift-giving decisions on your relationship with recipients. 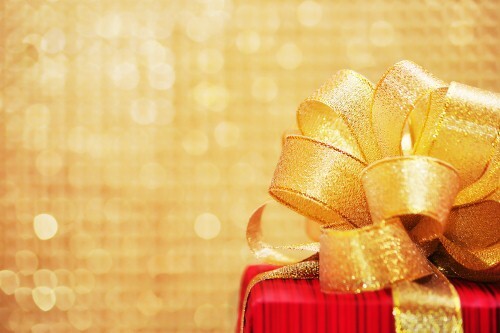 The presents you give to employees shouldn’t be the same as the ones distributed to clients. For inter-office gifts, give professional items. You want to remind workers that they’re being rewarded for their excellent effort over the last year. Additionally, you can personalize each present for your staffers. For example, you can have each employee’s name emblazoned on the side of their solar chargers. You can give clients gifts to help celebrate the spirit of the season. That said, don’t give something overly familiar that could alienate your customers. A custom pen with a USB drive is unique, but also keeps your relationships professional.